Pollution from many popular diesel cars is much worse when it is colder than 18C outside, new research suggests. Testing company Emissions Analytics told the BBC it has measured a significant rise in poisonous gas emissions from a wide range of models as the temperature drops. It found the problem is worst among the Euro 5 category of cars, which became mandatory in 2011. The firm tested 213 models across 31 manufacturers. The finding means millions of vehicles could be driving around much of the time with their pollution controls partly turned off. But it seems many cars are deliberately designed that way and it is all perfectly legal. European rules allow manufacturers to cut back on pollution controls as long as it is to protect the engine. Engineers agree that hot and cold weather can damage components. But some suggest car companies are taking advantage of the rule to switch things off, even in mild weather, because it improves the miles per gallon of the car. "I would say from the Euro 5 generation of cars, it's very widespread, from our data. Below that 18 degrees [Celsius], many have higher emissions... the suspicion is, to give the car better fuel economy," Emissions Analytics CEO Nick Molden told the BBC. "If we were talking about higher emissions below zero, that would be more understandable and there are reasons why the engine needs to be protected. But what we've got is this odd situation where the [temperature] threshold has been set far too high, and that is a surprise". Carmakers insist it is to stop the vehicles breaking down. There are currently 5.1 million Euro 5 diesels on Britain's roads and they are likely to be driving around for another 10 to 15 years. The Emissions Analytics data found the average Euro 5 vehicle was 3.6 times over the legal limit for poisonous Nitrogen Oxides (NOx) when it was above 18C. But that increased to 4.6 times over the limit, when the air temperature dropped. The latest generation of Euro 6 cars, on sale from September last year, were better, he added. They averaged 2.9 times the limit above 18C, rising to 4.2 times the limit at lower temperatures, but the figures were skewed by three especially bad performers, Mr Molden said, although he refused to name those cars. "That is the suspicion, or they're using their emissions system at a reduced level". Recent testing by the German, French and UK governments uncovered a similar trend. Many popular models polluted more when it was colder. In Britain for example, experts checked the same Euro 5 Range Rover Sport early on a cold morning, and then later in the day when it had warmed up. Its pollution (NOx) levels nearly doubled when it was colder. Jaguar Land Rover said it was a car that was engineered 10 years ago and had the best emissions equipment available at the time. It is not on sale any more. Professor Ricardo Martinez-Botas from Imperial College London, the independent engineer overseeing the British tests, told the BBC that despite decades designing engines he was "shocked" at the higher pollution levels on the real road compared to the lab. He is calling for carmakers to be more open about what they do with temperature. "They need to be clear as to what strategies are employed," he said. 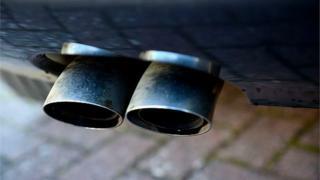 The German government has asked Opel, Mercedes, VW, Porsche and Audi to upgrade the software controlling emissions on around 630,000 European vehicles, including thousands in the UK. Unlike in Germany though, the UK government hasn't asked car firms to make changes. A Department for Transport spokesman said: "The regulations are clear that temperature control devices can be justified to prevent engine damage, but we want to see action to ensure that manufacturers are only using these systems in limited circumstances". Still, some argue that ministers are failing to get tough on powerful carmakers which employ lots of people in Britain. Carmakers keep engineering details close to their chest, so we don't know for certain how any of their systems work and at what temperatures. They argue that this information is commercially sensitive and stress they haven't broken any rules. But there is some information available that gives clues. Vauxhall has been accused by German media of not using one of its diesel cleaning systems for 80% of the time on one model. It is something the company flatly denies. "Exhaust gas recirculation [the emissions cleaning system] remains active at temperatures below 17C, however, for physical reasons related to engine protection as permitted by the regulations, with differing rates", a spokesperson for the firm said. In other words it is on, but not at full strength below 17C. Suzuki said it is changing the software on 3,200 cars in the UK, all of which use Fiat engines, and added it is linked to temperature. Fiat could not provide numbers but did say: "As a voluntary measure, not mandated or requested by any regulatory authorities, FCA will be updating its Euro 6 calibrations with new data sets to improve emission performance in real driving conditions". Renault is offering anyone with a car bought from September last year to July this year a software upgrade that will double the temperature range of the emissions system. And Mercedes say they will adjust around 26,000 A class and B class models in the UK, all with Renault engines and it will lower NOx levels. Ford says its system works normally until it gets to -10C outside. Mike Hawes, the chief executive of industry body The Society of Motor Manufacturers and Traders, told the BBC: "Any manufacturer that's responded has done so on a voluntary basis, because all the vehicles that have been put on the road are legal. It's a small number". Mr Hawes also stressed that it was all about protecting engine parts, which is good for customers. European regulations will begin to get much tighter from 2017 although they will not be fully in place until 2021. Mike Hawes says it will get rid of this temperature issue completely. What it will not do of course, is deal with the millions of cars driving around for the next 15 years that could be affected. Pollution is a balancing act. The down side of cutting NOx gases is that the engine uses more fuel. The more fuel you use, the more carbon dioxide the car puts out and that's a greenhouse gas that harms the planet. Emissions Analytics found that, in 2015, average mpg dropped for the first time in years. Probably because the car firms are concentrating more on cleaning up NOx. "That is evidence that the tightening emissions regulations are having a negative effect on mpg," Mr Molden says. Although he thinks vehicle engineers will eventually find a way around the problem. Pollution has been linked to heart attacks, strokes, breathing problems and premature babies. There is a suggestion that children going to school near busy roads may develop smaller lungs. Professor Frank Kelly at King's College London has been calling for tighter rules for years, especially with diesel vehicles. "On average we think pollution is probably taking away about six months of life for the average British citizen," he says. Diesel cars: What's all the fuss about?